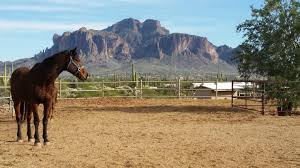 Apache Junction is located at the most eastern border of the Valley at the foot of the Superstition Mountains just 35 miles east of Phoenix. At the turn of the century and later the lure of gold in “them there hills” brought many miners to the area, setting up camps in search of fortunes and the legendary Lost Dutchman Mine. Heavily influenced by Native American cultures, Apache Junction offers a contemporary life style with the Old West frontier. Jeep tours, horseback riding and fishing are just some of the outdoor activities available to residents and visitors daily. Thousands attend Apache Junction’s yearly Renaissance Festival, and boating is a favorite sport due to its proximity to Saguaro, Canyon and Apache Lakes. Apache Junction’s year-round population of 45,000 swells to 75,000 when winter visitors arrive, spurring brisk business for hotels, camping grounds, restaurants and tourist attractions such as Goldfield Ghost Town. For that alluring mix of an Old West town and modern housing, Apache Junction is worth exploring for your next home. The median home value in Apache Junction is affordable at $162,600. Apache Junction home values have gone up 8.8% over the past year and is predicted to rise 2.7% within the next year. The median list price per square foot in Apache Junction is $125, which is lower than the Valley average. The median rent price in Apache Junction is $1,062.